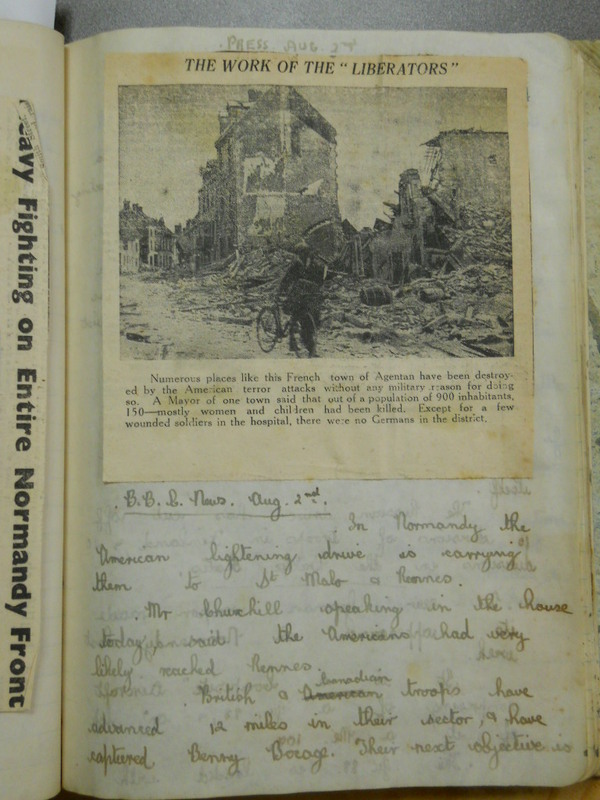 The Robert D. Farber University Archives & Special Collections Department holds an unusual scrapbook created in the Channel Islands during World War II. 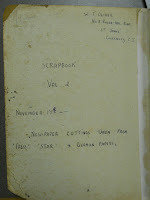 The scrapbook, made by “W.T. 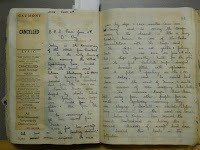 Oliver, 8 Rouge-Val Road, St Johns, Guernsey,” ranges in date from November 16, 1943, to August 21, 1944, and also contains a letter from August 25, 1945. 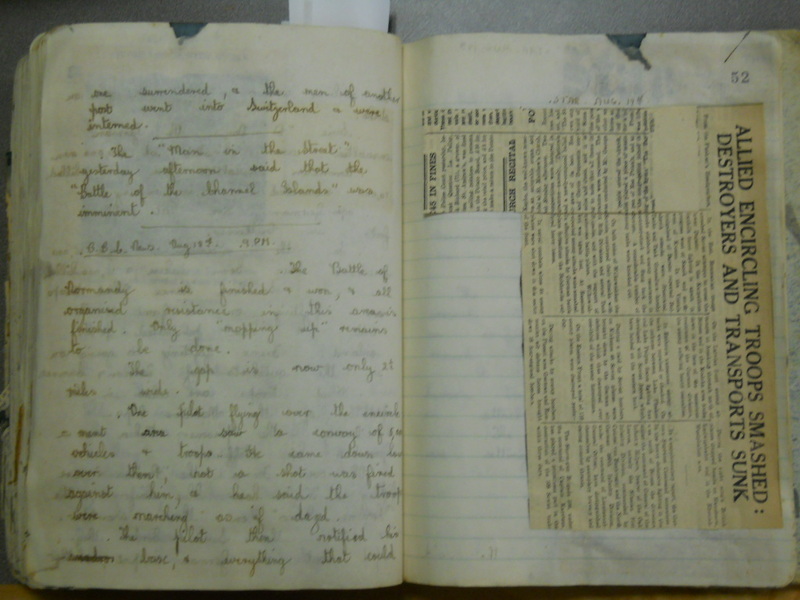 Entitled “Volume 2” (the location of Volume 1 is unknown), the book includes handwritten records of BBC war broadcasts—illegal at the time—juxtaposed with newspaper clippings of German wartime reports from local commandeered newspapers on the island of Guernsey. 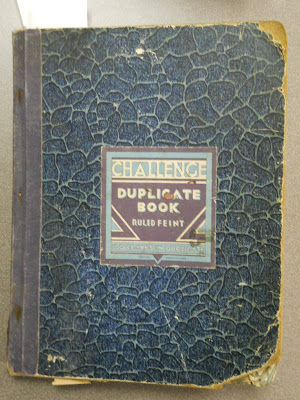 To understand the import of this Guernsey scrapbook, one must first understand Guernsey’s status and role during World War II. Guernsey is one of two autonomous island groupings (the other is Jersey) that make up the Channel Islands, located in the English Channel northwest of the French coast. The Channel Islands are British Crown dependencies, though they are not part of the United Kingdom. The islands have both the honor of being the oldest possessions of the British Crown and the more dubious distinction of being the only British soil occupied by Germany during World War II. Realizing that they could not properly defend the Channel Islands at the start of the war, and seeing only minimal strategic importance in the islands, the British demilitarized the region in 1940 to try to prevent military targeting and bloodshed within the archipelago. The British also offered to pay for the evacuation of all Channel Island residents to England. However, only half of the islands’ residents had evacuated (primarily draft-age men, children, and some women) when Germany—which had not learned of the British demilitarization—bombed Guernsey’s main harbor on June 28, 1940, killing or critically injuring over sixty residents. 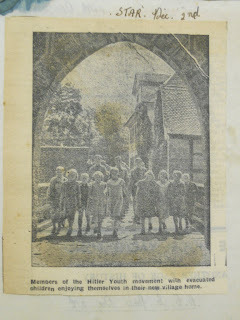 Two days later, the Germans quickly and quietly occupied the entirety of the Channel Islands, announcing the regime change to residents via requisitioned local papers on July 1. Despite Durand’s and Leale’s assertions, life on the Channel Islands under German rule was not entirely “benevolent,” nor was it absent of resistance and, by consequence, detention and punishment. Outnumbered by a large and well-armed German military force, and in light of their own low chance of escape due to island geography, island residents knew that large-scale resistance would lead to equivalent and likely bloody retaliation. Even so, residents regularly committed small acts of sabotage, cutting cable lines and defusing mines. When the German regime imported Jews and other political prisoners from across Europe to slave labor camps on the islands (the only instance of Nazi concentration camps on British soil), some local residents publicly objected to the prisoners’ harsh treatment and offered the prisoners food, shelter, and hiding places, in cases of escape. Similarly, when in late 1942 the occupying regime announced that all Jewish residents and non-Channel-Islands citizens (British and otherwise) would be sent to camps in Germany, local Guernsey residents protested the deportations by assembling en masse on the public docks at the deportees’ time of departure. By far the most common small act of resistance, however, involved owning and listening to the radio. Following a few short-term bans on radio ownership early in the war, the German occupiers banned resident radio ownership entirely in June 1942 for security reasons. If found in possession of a radio, Channel Islands residents could be punished with exorbitant fines, imprisonment, hard labor, or even death. 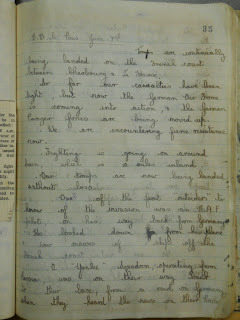 In response, some residents turned in their radios, then built their own crystal radio receivers according to specifications noted on the BBC; others hid their radios in “prams, manure heaps, beds, even… a washtub full of soapsuds.”2 Still others organized news services, like the Guernsey Underground News Service (GUNS), whose members secretly recorded BBC reports in shorthand and then distributed the information via word of mouth or printed news briefs to hundreds of their fellow islanders. These secret news services were so successful that even when the punishment for radio ownership was most dire, the Allies’ major wartime successes were known across the islands within two hours of key BBC broadcasts. 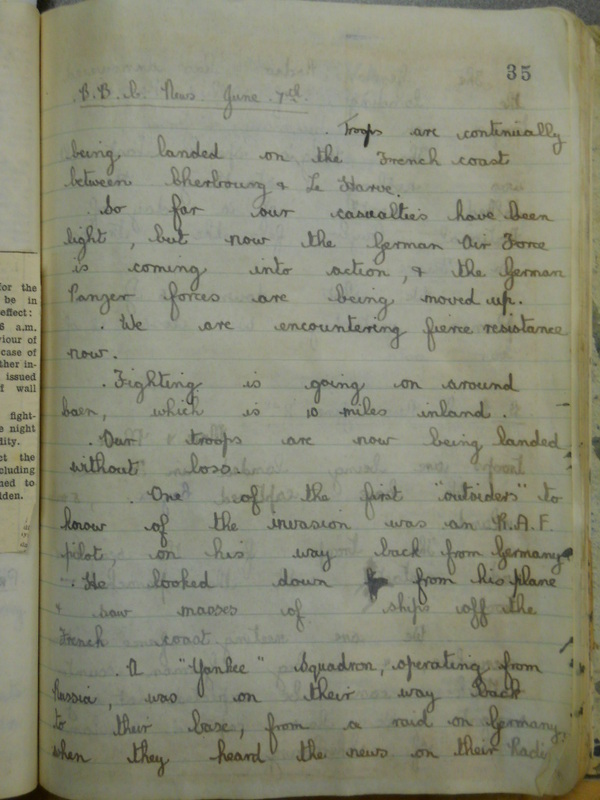 This ability to circumvent German information censors greatly boosted morale among islanders, and also greatly diminished the morale of German soldiers, leaving them jittery and on edge throughout their island occupation. 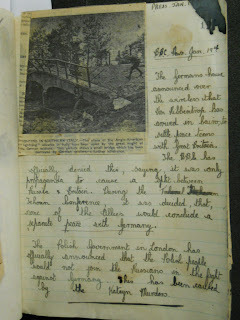 The Guernsey scrapbook held by Brandeis’s Special Collections is one such illegal record of a Guernsey resident who documented BBC broadcasts. 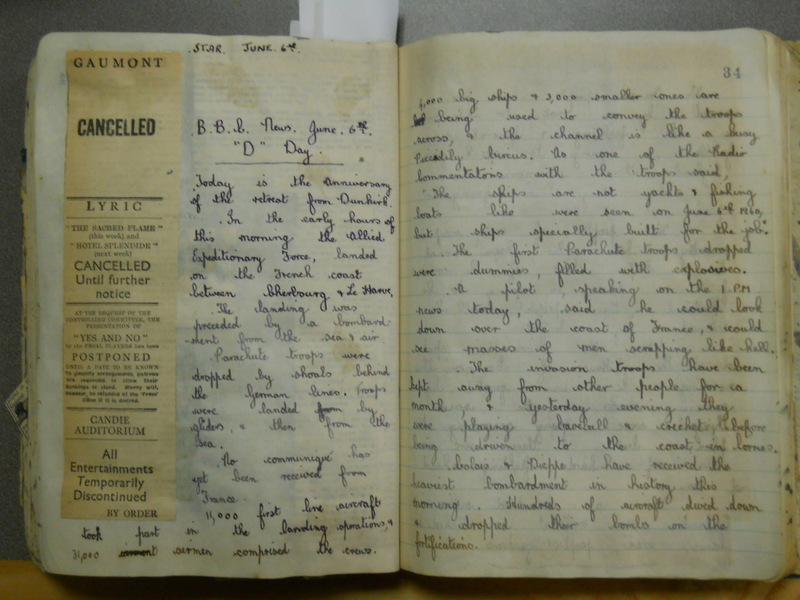 The scrapbook details BBC reports of the Allies’ battle successes and bombing raids—news that likely offered much-needed hope to war-weary Guernsey residents. Technology is a theme throughout the text, with comprehensive notes on BBC reports of Flying Fortresses and other aeronautical inventions of the Allies combining with German photos from local Guernsey newspapers of Messerschmitt jet fighters and Panther tanks. 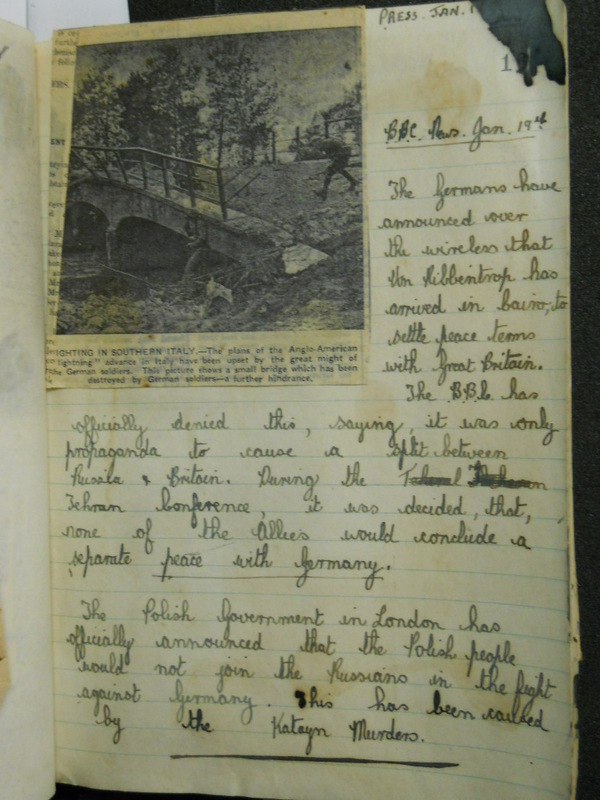 In addition to military technology and bombing raids, the scrapbook also gives insight into the day-to-day wartime experiences of Guernsey residents. Alongside the BBC broadcasts, newsclippings from Guernsey’s local papers, the Star and the Evening Press, reveal the practical realities of life on the occupied island. Numerous clippings record the changing ration rules for food, fuel, and “luxuries” (for example, women were given extra cigarette rations at Christmas in 1943). 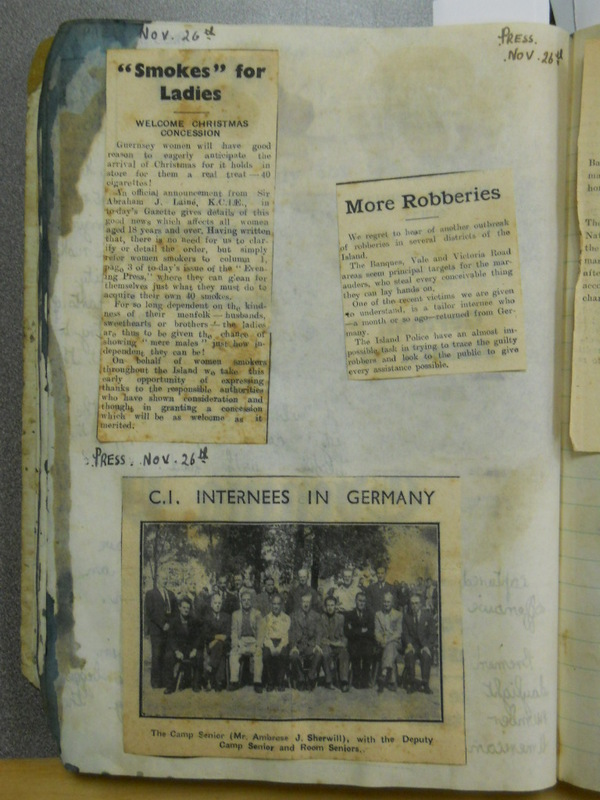 Other clippings reflect the increasing restrictions experienced by islanders under German occupation, including announcements (in English and German) of extended curfews, limited coastal access, prohibitions on certain items (like radios), and penalties for ignoring regulations. 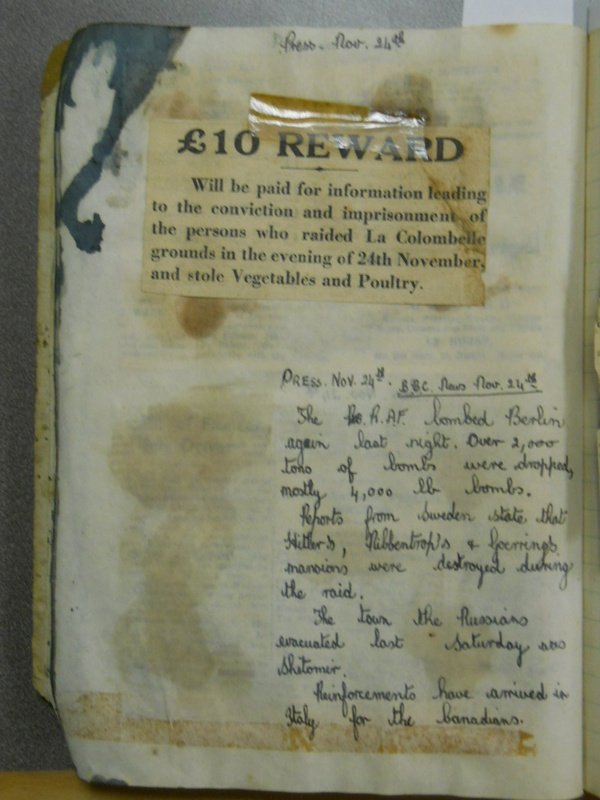 The scrapbook also contains articles that follow the prosecution and punishment of local residents for sabotage and theft, both common occurrences as war tensions increased and rations became scarce. The sarcasm and threat implied in this statement, published in a German-commandeered but English newspaper, reflect the underlying tension and menace that was the norm in wartime occupied Guernsey. 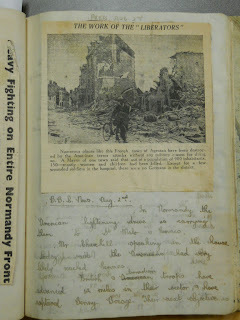 In turn, the fact that this scrapbook newsclipping is followed by extensive BBC broadcast notes on the Allies’ D-Day successes demonstrates how BBC radio access helped maintain islanders’ morale. Sadly, items similar to this Guernsey scrapbook, proving illegal wartime radio use, caused numerous Guernsey residents to be imprisoned over the course of World War II. In a number of cases, these individuals were sent to their deaths in Nazi camps across Europe. For example, the five leaders of GUNS, Guernsey’s secret BBC news service, were betrayed by informers in 1944; at least one died due to his resulting incarceration in Nazi camps. In all, over 2000 Channel Islanders were deported to prison camps, including both men and women, elderly individuals and children, for “crimes” ranging from radio listening, minor sabotage, and prisoner aid to the simple fact of identification as a non-Channel Islands citizen or as a Jew. 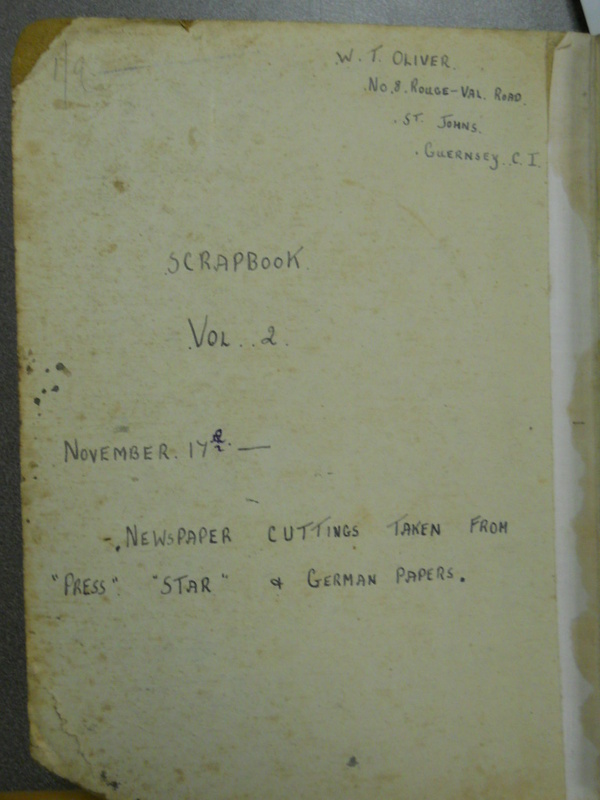 Due to the risks involved in its creation, the Guernsey scrapbook housed in Brandeis’s Special Collections is a testament to the determination of Guernsey residents to maintain their hope in and patriotic connection with England in the face of years of German occupation. As important, the text offers an uncommon combination of material, documenting the wartime views and propaganda of opposing sides in the World War II conflict. 1 Ralph Durand, Guernsey Under German Rule (London: The Guernsey Society, 1946), 29. 2 Madeleine Bunting, The Model Occupation: The Channel Islands under German Rule, 1940-1945 (London: HarperCollinsPublishers, 1995), 209. Bunting, Madeleine. The Model Occupation: The Channel Islands under German Rule, 1940-1945. London: HarperCollinsPublishers, 1995. Cohen, Frederick. The Jews in the Channel Islands during the German Occupation, 1940-1945. St Helier, Jersey: Jersey Heritage Trust, 2000. Cruikshank, Charles. The German Occupation of the Channel Islands. New York: Oxford University Press, 1975. Durand, Ralph. Guernsey Under German Rule. The Guernsey Society. London, 1946. We found a book with the dates January 16 1943 through february 1945. Is there any chance that the book we have is the first volume. 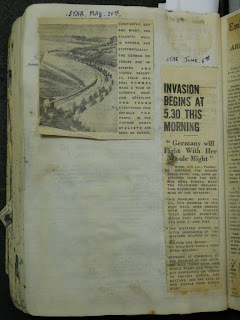 It's filled with newspaper clippings of world war 2 angaint the Germans. If you have any information please reply. 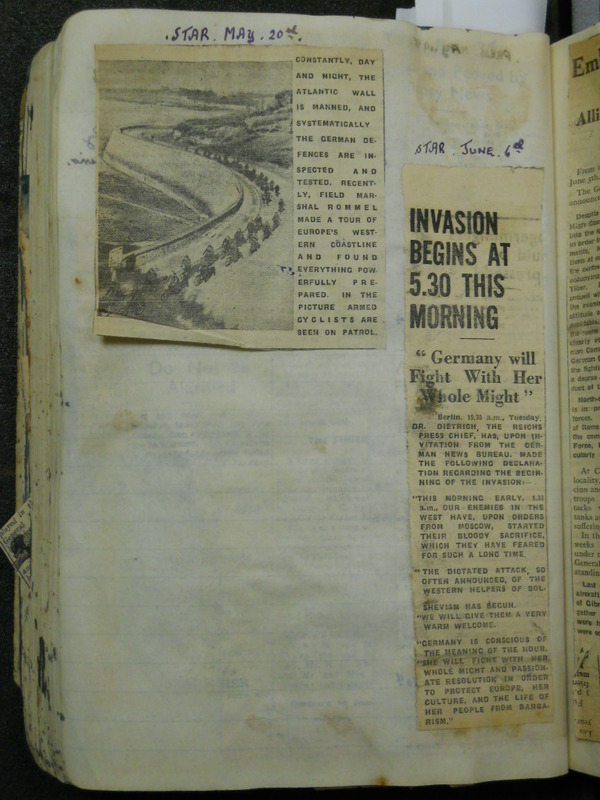 W recently found a book with newspaper clippings from january 1 1943 to february 13 1945. is there any chance this here is the first voloume? The newspaper clippings are from world war 2 againts the Germans if you have any information please reply. It would be greatly appriciated. We would be happy to talk more about your item. 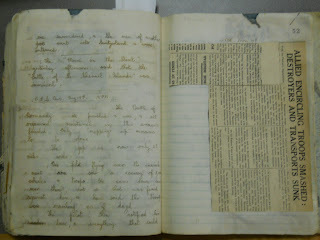 Please contact us at archives@brandeis.edu to discuss it further. Thank you for your interest!